So today was Uriah and Courtney's last day in Wellington and they are both big Lord of the Rings fans, so we headed over to Weta Workshop for a behind the scenes tour. Unfortunately, you can't take photos in the workshop, but it was AWESOME! The tour guide was funny and we had a good group and we got to see some cool stuff. 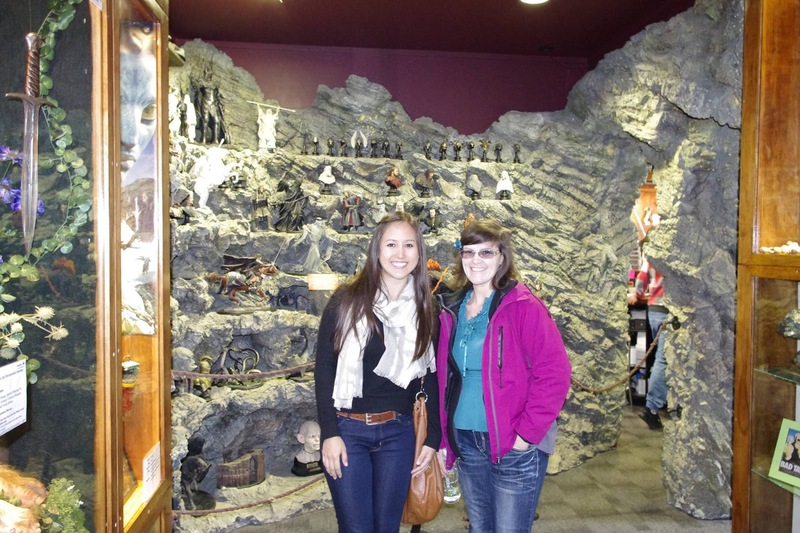 Here is Courtney and I in the Weta Cave (otherwise known as money-tourist trap, but still cool!) before our tour. It was super awesome and I recommend anyone who ejoys the movies to check it out. Then we headed to lunch and went to Pizzeria Napoli. It was SO yummy! Uriah had a calzozne, Courtney got stuffed shells, and I got the pollo pizza. It was all so yummy! I want to go back so bad and eat the stuffed shells. The pizza was good, but the stuffed shells were AMAZING! I love good food and I have to workout really hard so that I can eat all the yummy food.